Hong Kong’s biggest music and arts festival offers a unique experience with a kaleidoscope of music, arts, performances and fun attractions that unites all ages. Clockenflap 2018 takes place over Friday, November 9 to Sunday, November 11, 2018 at Central Harbourfront. Clockenflap is Asia’s premier outdoor music and arts festival, and a major highlight of Hong Kong’s annual cultural calendar. Cultivating and celebrating creativity, the festival is an unrivalled cultural mix of local and worldwide talent with a mission to inspire individuals through a journey of music and arts. 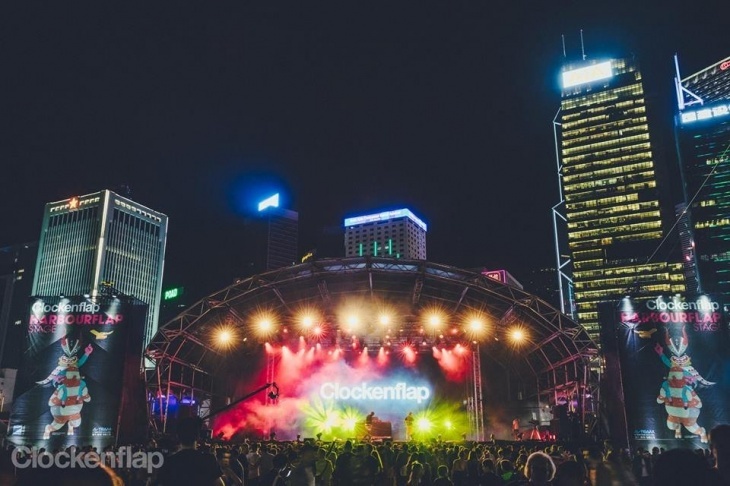 With a dazzling and diverse selection of activities, Clockenflap is a world-class festival that encourages people to come together with openness and imagination. Clockenflap takes place at the Central Harbourfront and is bigger than ever: Running from the Central and Western District Promenade park to the IFC footbridge. The festival’s spectacular setting combines grassy fields, harbor views and Hong Kong’s unique city skyline. The venue is easily accessible from all public transport. Clockenflap features a diverse range of artists and an array of stage settings to best showcase the talent on offer. Over the weekend, these music stages will showcase must see international talent, regional favourites, musical legends and up-and-coming acts. Clockenflap will have a host of convenient bars around the site and an extensive choice of food, various family-friendly attractions and markets. Clockenflap features a cornucopia of arts. Discover and interact with giant sculptures, parades, street art and virtual reality environments. It's about discovery, about community. About laughter, camaraderie and unashamed nonsense. It's about the independent spirit, celebrating creativity and paying it forward. It's about shoes off on the grass and time machines. It is the best weekend's worth of fun to be had in Hong Kong. Early birds discount is available! From Admiralty Station (exit A) head towards Tamar Park, walk through the park towards the Waterfront Promenade and turn left. Approximately 10 minutes walking distance.